We have been busy supporting our partners Kent Community Health Foundation Trust (KCHFT) and Kent County Council (KCC) to scale up Buurtzorg in their organisations, and recruit two new teams to complement original team created as part of the TICC programme. Representatives from CCGs, the voluntary and third sector, local authorities joined health and social care professionals to find out more about setting up and working as a member of a self-managed team. Sessions explored how Buurtzorg is driving real change in delivering integrated community care, right here in the UK and how working in a self-managed team, supported by coaches, differs from the normal hierarchical, ‘top down’ approach. Participants heard, first-hand, how self-managed teams are delivering high quality person centre care for patients. KCHFT and KCC are creating two more pilot teams in the context of TICC, following their first, integrated team in Edenbridge. The event aimed to share what the Buurtzorg model entails, as well as the TICC project, with interested parties, be they stakeholders in the community, individuals who may want to apply for the roles in the teams or anybody else for that matter! 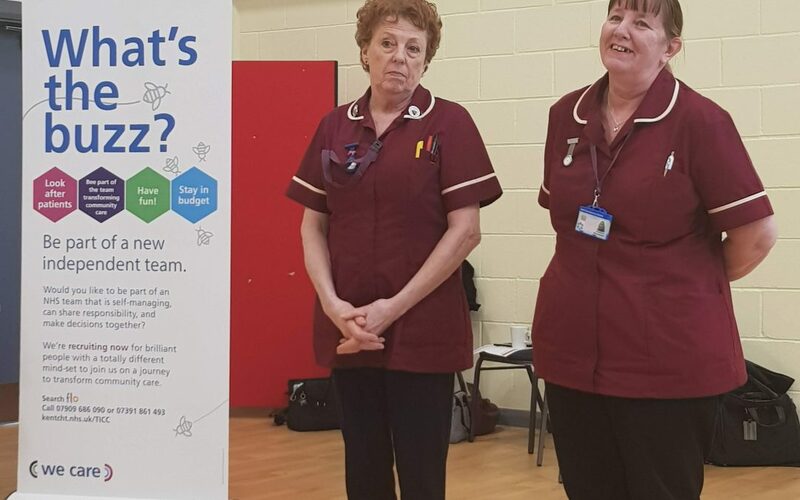 Medway Community Health, Kent Community Health Foundation Trust and Kent County Council are the three UK ‘delivery partners’ participating in TICC and implementing the model, with pilot teams being the first step. They are being supported by Buurtzorg Britain and Ireland to better understand how the Buurtzorg Model can work in a UK context.